What Does "Broom Clean" Mean? If you're like most tenants, as you near the end of your lease term, you'll likely start thinking about what you need to do to ensure you'll get back your security deposit. The first place you might look for the answer is your lease, but you'll probably find it's not too enlightening. Chances are, your lease says little more than that you need to leave your apartment in "broom clean" condition. What does this mean and do you need to go out and buy a broom? Reasonable wear and tear are okay. It's not the time to start making repairs, and it's probably not your responsibility anyway. Hopefully, unsightly or defective parts of your apartment–such as cracks in the ceiling or damaged window molding–are items that you brought to the landlord's attention when you moved in. If you failed to report damage when you moved in or if the damage occurred while you were living there and you didn't notify your landlord at that time, you might have a problem. At this point, it's best to point out all damage to the landlord and explain when it occurred. If you leave it for the landlord to discover during his walkthrough, you're more likely to be liable for the damage. Don't repaint the apartment. Your landlord may give your apartment a fresh coat of paint between your move-out and the next tenant's move-in. But you don't need to do this. However, if you've painted any of your apartment walls—with or without permission—during your tenancy, you should paint it back (unless your landlord told you otherwise). At most, you might want to treat some tiny areas with touch-up paint or with products such as the Mr. Clean Magic Eraser (compare prices). Although this may not be required, sometimes small aesthetic fixes can contribute greatly to the overall impression of an apartment. Remove nails from walls. Inspect your walls to make sure that any nails, hooks, or other devices you've used to hang frames and other items are gone. Take the extra step and spackle the area to fill the small holes that remain. Put yourself in your landlord's shoes. Think about what would make you satisfied if you were the landlord inspecting the apartment after your tenant moved out. Another strategy is to pretend you've been renting the apartment for free from your best friend and you want to leave it looking as presentable as possible for your friend's return. Consider hiring a cleaning service. If you already have a cleaning service regularly clean your apartment, schedule the last cleaning for a day or two before you move out. If you've been handling the cleaning on your own, do a thorough job before you leave for good, or hire a service to help you out this last time. Cleaning services commonly have a special rate for cleanings before a move-in or move-out, with prices based on the size of the apartment and whether or not it will be empty. 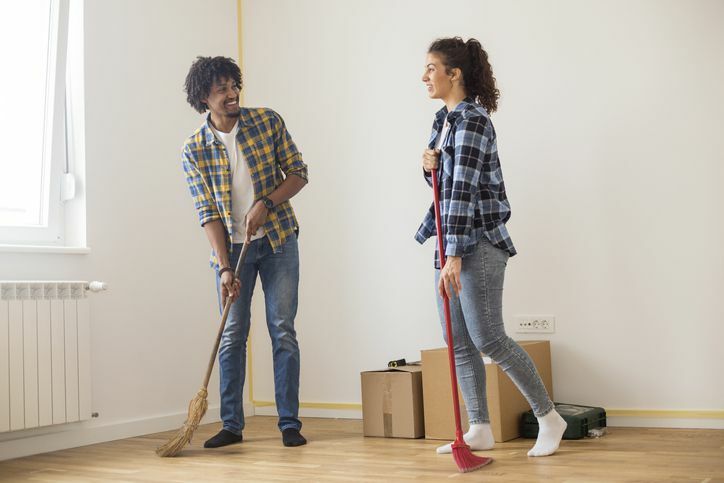 If you follow these pointers, you should meet the requirements of your lease to get your security deposit back—even if you don't own a broom.